There were many newsworthy items in the 2011 golf world and obviously I can’t mention all of them. But here are a few which stand out in my mind, with relevant links to the original HOG posts. 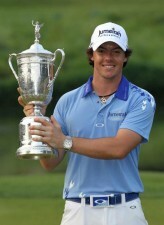 Part One of my look back at the golf world of 2011 covers professional golf, January to June. Part two, tomorrow, covers July to December. 2011 was a year of parity. No player won more than two times on the PGA Tour in 2011. The official world golf rankings were about as volatile as John Daly in a Hooters. The #1 golfer in the world position seemed like a hot potato, switching from Lee Westwood to Martin Kaymer to Lee Westwood to Luke Donald. Ben Crenshaw recorded a 59, his 59th birthday. David Feherty joined Golf Channel. Camillo Villegas signed with TaylorMade. Later he was disqualified at the Tournament of Champions. Tiger Woods begins his free fall from the top of the world golf rankings. Rookie Vegas wins Bob Hope in 3-way playoff. The billion dollar Tiger Woods golf project in Dubai is scrapped – Abandoned Dunes. Martin Kaymer moves to #1 in the world, Luke Donald #2. People freak out because Bubba Watson wears a $525K watch which was loaned to him by watch sponsor. The PGA Tour allows mobile devices at their tournaments. Tiger Woods “spit gate” in Dubai. Later Tiger apologizes via Twitter. Tiger Woods puts his yacht “Privacy” up for sale for $20 million. My attempts to get 20 million people to each chip in $1 and buy it with me fail. Mega hot LPGA player Sandra Gal wins first LPGA tournament. During a time when Tiger Woods’s swing was not working well, the Tiger Woods golf swing app is released. I interview Fred Funk. What a cool cat. Team Lake Nona wins the Tavistock Cup. Japan earthquake and tsunami rocks the world. Charl Schwartzel wins the 2011 Masters with amazing string of four birdies on the last four holes. Rory McIlory blew a huge lead in the Masters, but handled the loss with class. Phil Mickelson wins the Houston Open. Rookie Keegan Bradley records first win of PGA Tour career at the HP Byron Nelson and I WAS THERE. Hooked On Golf Blog talks HP Byron Nelson on ESPN radio. HP invites me to cover the HP Byron Nelson Championship as resident blogger and social media expert. What a blast. David Toms, after losing the previous week at THE PLAYERS when he missed a 3 foot putt in a playoff, lights it up with two 62’s at Colonial. Tiger Woods drops out of top 10. One of my favorite players on this planet, K.J. Choi, won THE PLAYERS Championship. Tiger Woods withdrew from THE PLAYERS after nine holes. Golf world saddened as legend Seve Ballesteros died at the young age of 54. RIP Seve. You will be missed and always remembered. Rory McIlroy destroys the field at the US OPEN shooting 16 under par and blowing away Tiger Woods previous US OPEN record score of -12. McIlroy set a number of records which may never be broken. I doubt Congressional will hold another major. Tiger Woods’s caddie Steve Williams moves to Adam Scott’s bag for the US OPEN. After 354 tries, Harrison Frazar finally wins a PGA Tour event. If at first you don’t succeed, try 354 more times. I really enjoyed watching the 2011 US Masters especially seeing a couple of Australians fighting it out for the title. The US Open was brilliant to watch with Rory McIlroy playing fantastic golf and showing the golfing world he had officially arrived. You should try your clubs in one of the exotic golf courses of the paradise island of Bali. No place like that for using your very new acquisition.